byBruce Harper and Yasser SeirawanExplore the unique and confusing chess ofCanadian Grandmaster Duncan SuttlesIn the era before computer-driven homogenization of chess styles and the instant transmission of new moves through the internet, chess players had distinctive styles, and none was more distinctive than that of Canadian Grandmaster Duncan Suttles. Few players has been as willing to take risks as Suttles, and his games combine fearlessness and creativity in a unique way. Suttles played fighting, uncompromising chess. While his ideas may not always have been objectively correct, his opponents' faced the challenge of proving that at the board. 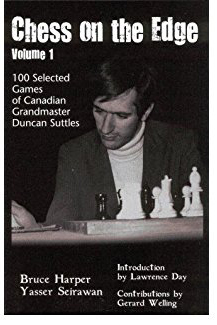 Suttles was not afraid to lose games, and he was even less afraid to lose post-mortems!In this, the first volume of a three-volume series, 100 of Suttles' games are analysed in detail. Readers of all levels of experience and ability will enjoy these games and learn from them.